This story was first published in New Matilda on May 12, 2015). Bruce Begnell, who is currently facing eviction, has always maintained that he owns his home in Welfare Street, Homebush in Sydney’s West but he has never been able to prove it. 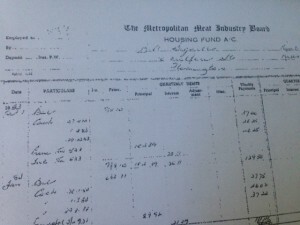 Now documents sighted by this reporter show that he paid both principal and interest off the home regularly from 1966 until he completed payments in 1984. Bruce and Lyn Begnell's home is on of a block of land for affordable housing that was owned by the Sydney Olympic Park Authority (SOPA) until November last year, when the NSW Baird government sold the block to property developers HBW Property Trust No 1 for $5.8 million. A legal submission setting out Begnell’s claim to ownership to his home was sent to SOPA on March 16, 2015. HBW Property Trust Pty Ltd No 1 is part of the Centennial Property Group that was established in 2011 by property investors Lance Rosenberg and Lyle Hammerschlag. According to its website, the group specialise in offering investors the chance to join syndicates to purchase properties that they could not otherwise afford. The investors in this and other unit trusts remain secret, although according to its website, the owners of CPG usually take an interest themselves. Only a month after HBW Property Trust purchased the Welfare Street block, it resold each of the 12 homes separately through real estate agents Strathfield Partners to individual investors for a quick profit of nearly $5 million. 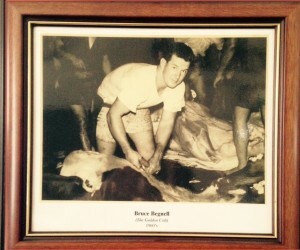 In fact, according to Mr Begnell, he paid approximately half of his wage of $54 as payments for the house to the Metropolitan Meat Industry Board, which he finally paid off in December 1984. The principal sum began as $4,000, which back in those days was a considerable amount of money, and about what it would have cost to to buy a house and land in the Homebush area near the meatworks. Over the years, Begnell made improvements that might be expected of a homeowner with practical skills. He added a bedroom and a new kitchen to his home, tiled the bathroom and laid polished floorboards. He also built a garden shed. Now in his 80s, blind and in poor health, Begnell had expected to live with his wife Lyn in the familiar surroundings for the rest of his life. A desperate campaign by Lyn Begnell to save the house for both her own husband and her neighbours has been spurred on by medical reports that her husband’s health will be put at further serious risk if he is forced to move. Over the years, the original legal agreement was lost. In 1989, the Metropolitan Meat Industry Board became the Homebush Abattoir Corporation, which owned the land until it was handed over to the Sydney Olympic Park Authority during the period leading up to the 2000 Olympics. Although Begnell and his neighbour, John Higgins, both insisted that their families had purchased their homes, until recently, neither of them had the records to prove it. Although SOPA officials could have investigated the original records, it would appear they did not attempt to do so. Instead, Begnell, who is illiterate and did not receive any legal advice signed a pro-forma tenancy agreement, some parts or which remain blank and some of which he did not understand. Higgins told me that he refused to sign a lease because he had always understood that his father bought the home. HBW Property Trust sold the homes at auction as single properties. However when New Matilda did a search of the title of the properties, we found that the NSW government still held the title to the whole block at the time the auction took place. Although this is legal, it highlights the rush to offload the properties as soon as possible. I rang Strathfield Partners Managing Director Robert Pignatoro, who told me that my search must be wrong and there was no doubt that the first sale was completed. I was disconnected and was unsuccessful in further attempts to contact him. About a month after the homes had been sold, the title was finally transferred from the NSW government to HBW No 1 Pty Ltd, the trustee company for the unit trust. However before HBW No 1 Pty Ltd can complete the sale to the unidentified investors, the title must be subdivided into separate blocks. As further evidence of the rushed transactions, an application to subdivide the block was only lodged with Strathfield Council a few days before the auction. Nearly five months later, the land has not yet been subdivided and most of the residents remain in their homes due to assistance from the Marrickville Inner West Tenancy Service. The Marrickville Legal Centre objected to the subdivision on a number of grounds, including the loss of affordable housing and social impact on the neighbourhood and its residents. The workers’ cottages are also listed as part of the local area’s heritage. After Strathfield Council failed to process the subdivision application within a month, the company exercised its option to take the application to the NSW Land and Environment Court. The court agreed that the residents could be included a parties to the proceedings. Confidential negotiations between the parties are continuing. Since Strathfield Council is not objecting to the subdivision, it is likely to be approved, leaving the developer free to complete the sale to the unidentified buyers. This again leaves the residents vulnerable to eviction. Even though they are protected tenants and there is evidence that at least two of them bought the homes, HBW No 1 Pty Ltd wants them to move out. HBW No 1. Pty Ltd has now offered the residents payments in return for moving out of their homes. The details of the offer are confidential. However even with these payments, the residents lose access to the affordable housing they have lived in for many years, without sufficient resources to buy or rent equivalent housing. Welfare Street is a street of solid brick comfortable homes. In a city in which there is a crisis in affordable housing, houses such as these are prized. The homes are also listed on the local area’s heritage register and part of its industrial history. Along with John Higgins who lives next door, Begnell can remember when Parramatta Road traffic gave way to cattle crossing to the saleyards. On hot days, the children swam in the sheep dip ponds. Now that the documents proving the purchase have been found, it is at least arguable that the Begnells and Higgins have a legal interest in their properties, drawing on an old principle called ‘proprietary estoppel”. The principle is that if an owner of land allows a person to spend money on land in the expectation that they have an interest in that land, and that person is disadvantaged, then there should be a legal remedy. I put written questions to the Minister in January, but was referred back to SOPA, who also declined to answer questions about what role the SOPA Board played in the decision to sell the land, and whether the Minister was involved or gave approval. The SOPA Board is chaired by ex-Labor Minister Michael Knight and includes property developer David Baffsky and ex-head of Corrective Services, Ron Woodham. McKay drew attention to the role of Lyn Begnell who has led the campaign to save not only her home, but also those of her neighbours. Begnell and Higgins have always claimed they had the right to occupy the properties, so this should have been noted on SOPA files. Since March this year at the latest, they have been fully informed about the legal claim. But instead of protecting the residents, the NSW government has washed its hand of its obligations. Whether the residents are tenants or owners, or both, the NSW government should take steps to secure them in their homes. This could include buying the homes back from CPG developers at the price they sold them for, and establishing them as affordable housing for the future. I've read a copy of the contract which gives HBW No 1 Pty Ltd the option not to complete the sale to the auction buyers if the subdivision does not go through. The Baird government claims that in its second term, affordable housing will be a priority. It would be a start if it could begin by retaining what currently exists. New Matilda has submitted questions to both SOPA and Minister Ayres and will add them to this story if and when answers are received.